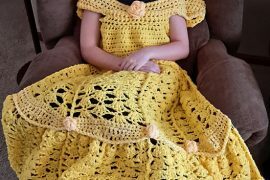 Linda Davie so generously shared her story with us last fall about dealing with cancer and how she used crochet to help keep herself healthy and distracted. She loves to crochet to give to others. Linda’s latest project. “She found a pattern in Russian for crochet tortoises, so spent a very long evening translating the pattern into English and made this fantastic tortoise and is planning at least a couple more.” One of the tortoises that she’s working on now is a rainbow tortoise that she’s making to help fundraise for a gay teen suicide prevention function that Debbie is holding next month. I was so happy to hear this. This pattern has been translated by me with the help of ‘Google Translate’ and ‘Bing Translate’ from a pattern written in Russian – “from the author of ‘Owl with Country Artists’ site, Solovyov”. I make no claims to ownership of the original pattern nor am I gaining any financial benefit from sharing a pattern that is already freely available – I am merely re-presenting it in a form that others will hopefully understand. Any changes are unintentional and due only to differences in language or my interpretation of the given translation into US crochet terms. Link for the original pattern page. You will need to access this page if you wish to view pictures that may help you (for the skeleton structure, mouth and eye position) – I will not be reproducing them here. The turtles represented on the page are all made using the same thickness of yarn – but the turtles do get smaller in size as you go up the stack. From what I can tell, they have achieved this by using smaller hook sizes for each turtle. Three colours of yarn – I used 8ply Acrylic (Australian). Thick wire for the ‘skeleton’ and pliers to bend it. – I used an old wire coat hanger. 3.5mm crochet hook for body parts and 4.5mm crochet hook for the top shell and belly. Needle for sewing in ends and attaching eyes and mouth. The turtle is made in Amigurumi style of crochet – use a stitch marker to mark the beginning st of each round – move it after every round to the last stitch that you worked. inc: increase = 2sc in 1stitch. dec: decrease = sc 2sts together. 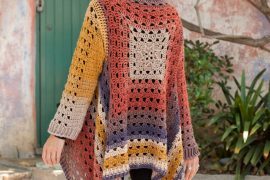 *There is no need to leave extra-long threads when finishing off body parts as they are attached to the body by crocheting in later rounds of the under-belly….not much sewing required other than sewing in ends! Rnd 37: (9sc, dec), 2 times (20sts) Rnds 38 & 39: 20sc, finish off. Leg (make 4). 5ch. Begin in 2nd ch from the hook, 3sc, 3sc in last st, 2sc, 2sc in last st. (10sts) *If using a stitch marker, place it on the last stitch…..rounds begin here. Rnd 1: inc, 2sc, inc in next 3sts, 2sc, inc in next 2sts. (16sts) Rnd 2: sc, inc, 2sc, (sc, inc) 3 times, 2sc, (sc, inc), 2 times (22sts) Rnd 3: 2sc, inc, 2sc, (2sc, inc) 3 times, 2sc, (2sc, inc), 2 times (28sts) Rnds 4-16: (13 rows): sc in ea. Rnd 17: 2sc, dec, 2sc, (2sc, dec) 3 times, 2sc, (2sc, dec), 2 times (22sts) Rnds 18 & 19: sc in each st around. Rnd 20: (9sc, dec), 2 times (20sts) Rnd 21: 20sc, finish off. 4 sc in a magic ring. Rnd 1: 4sc (4sts) Rnd 2: inc, 4sc (5sts) Rnd 3: inc, 5sc (6sts) Continue working rounds, inc in the first st of each round until you have 14sc in total, finish off. Top Shell – Spiral Hexagon. (make 7) It may look daunting, but long story short…..you are just working a normal circle, changing colours half-way round. Just take your time and follow each step. Join hexagons using one motif as a centre piece and connecting the others together around it using whichever method you are comfortable with using, either sc or sew together. I chose to sew mine together to get a ridge between each motif – either look is fine. There are different pattern suggestions shown in the pictures on the linked page, but they don’t actually give a pattern for them as such – you can just do a plain shell or create a random pattern. I did mine in dark grey and then did every 1st sc in each set in every round in light grey, then between those lines, I just placed random stitches of pink and light grey to tie in the top shell colours. 7sc in a magic ring Rnd 1: inc around (14sts) Rnd 2: (1sc, inc.) 7 times (21sts) Rnd 3: (2sc, inc.) 7 times (28sts) Rnd 4: (3sc, inc.) 7 times (35sts) Rnd 5: (4sc, inc.) 7 times (42sts) Rnd 6: (5sc, inc.) 7 times (49sts) Rnd 7: (6sc, inc.) 7 times (56sts) Rnd 8: (7sc, inc.) 7 times (63sts) Rnd 9: (8sc, inc.) 7 times (70sts) Rnd 10: (9sc, inc.) 7 times (77sts) Rnd 11: (10sc, inc.) 7 times (84sts) Rnd 12: (11sc, inc.) 7 times (91sts) Rnd 13: (12sc, inc.) 7 times (98sts) Rnd 14: (13sc, inc.) 7 times (105sts) Rnd 15: (14sc, inc.) 7 times (112sts) * Finish patterning here as this is where the shell-plate ends and the sides begin – continue in single belly colour. Rnd 16: (15sc, inc.) 7 times (119sts) * I wanted the ‘shell’ to have an edge, so I worked this row in the back loops only – it’s entirely up to you……you can just work a normal sc round if you wish – makes no difference overall. I also worked rnd 16 and the remaining rounds in light grey – you do not need to change colour if you don’t wish to. Rnds 17 & 18: sc around, do not cut off yarn. Rnd 19: 11sc, sc in next 10sts working through the leg piece and the shell together (pics on page), 10sc, 10sc joining next leg with body, 10sc, 10sc joining the head (ensure ‘chin’ side of the head – where you did the decreases in Rnd 25 of the head – is facing the under-belly), 10sc, 10sc joining next leg, 10sc, 10sc joining last leg, 12sc, 7sc joining the tail. Rnd 20: sc in each sc of the previous row, capturing the remaining free stitches of the limbs and head as you work your way around. Rnds 21 & 22: sc in each st around, finish off. Refer to the pics on the web page for making the ‘skeleton’ – you will need a piece of wire from the tail to the head, and two pieces of wire connecting legs in pairs, making sure to use the pliers to coil the ends of the wires so that they do not poke through the body. Before inserting the frame, I pre-stuffed the head, legs and tail about halfway. Insert the frame – I connected the legs and spine by tying with some scrap yarn but joining the skeletal pieces is referred to as an optional step – up to you. Once skeletal frame is in place, stuff the head, feet and tail around the wires to keep them roughly centered. Rnd 1:Align the top shell so that the head, legs and tail are located in line with the joins between the spiral hexagons on the top shell. Have the top shell facing you as you work. Using your top shell main colour and starting next to the tail, sc the 2 halves together. The top shell has 120sts, lower has 119 so sc all around and just take up the extra st when you get to the end of the row – it will not be visible on the finished turtle. It is a fairly tedious process to get the 2 halves together, but be patient – you’ll get there! Remember to firmly stuff your turtle before you finish this round and leave your yarn connected for the next round. Rnd 2: (2sc, inc) to end. Rnds 3 & 4: sc in each st around Change to contrasting colour. I used my swirl colour here – you can use whatever you like. Rnd 5: (6 sc, inc) around working your ‘inc’ sts into the sc’s of Rnd 3 (see photo on web page). Rnd 6: Change back to your main shell colour, sc in each st around, finish off. Now for the gorgeous face! Again – refer to the web page as there is a series of pictures that give you a very clear step-by-step guide to creating the face and attaching the eye beads, so I won’t bother to explain it in depth here…..I’ll just give the basic instructions. Embroider mouth, placing your stitches smoothly between the rows as pictured. To attach eyes, insert the needle into the corner of the mouth, and navigate it to the location of one of the eyes. Thread the bead into position, then push the needle back down to where you first inserted it near the mouth. As you tie-off the threads, pull tight enough so that the cheek and ‘smile’ is formed at the same time as the eye is pulled down into the head. Tie the ends off firmly and sew in thread ends. Repeat the same process with a new thread on the other side of the face. Now to make and attach the eyelids. The pattern as far as I could tell did not specify a bead size for the eyes – I used black 6mm wooden beads. When I made the eyelid stated in the pattern, it was far too big for my bead! I will provide you with the translated original eyelid pattern AND the one that I made up to fit my beads. Eyelid (make 2) – translated from original pattern; 10ch Starting in 2nd ch from hook, work 9 sc, turn. Sl st into 2nd st, 1sc, 3 dc, 1sc, sl st, turn. Ch1, 4 sc, 2sl sts, turn. Sl st into 2nd st, 1sc, inc, 2sc, 2sl st, turn. Sl st into 2nd st, sl st, 5sc, 3sl st, finish off leaving an end long enough to attach eyelid as per pictures on the web page. My Eyelid (make 2); (smaller than original pattern) 8ch Sl st into 2nd st, 7sc, turn. Sl st into 2nd st, 1sc, 3dc tog, 2sc, sl st, finish off leaving an end long enough to attach eyelid as per pictures on the web page. Congratulations…..you have just finished your very first ‘Russian Turtle’! For a slightly different look, I thought I’d also give you the option of a 3-colour spiral hexagon! instructions! Another tip….if you are confused about which colour you are up to, then copy and paste this pattern into a ‘Word’ document and actually change the colours of the (A), (B) and (C) in the written pattern to represent the actual colour of yarn that you are working with. Thank you this is so sweet! I just found the picture I had saved but didn’t know how I was going to do it without a translation. Thank you for sharing. very cute – thank you for sharing! In making the spiral hexagons for the top shell, I’d suggest the following slight tweak: Follow the directions up through the first times you use color A and color B, but starting the first time you come back to color A (the second time color A appears), crochet through only the back loop of each stitch for a subtle but nice optical effect. 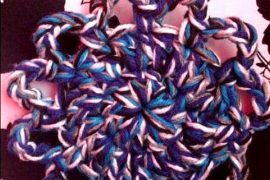 to color A (the second time color A appears), crochet through only the back loop of each stitch for a subtle but nice optical effect. back loop of each stitch for a subtle but nice optical effect. @M Thanks, I appreciate the extra info! That is awesome how you you translated the pattern to english. I think that it’s a lot of work. It makes me want to translate some spanish pattern to english. Thank you for sharing. The designer used an old coat hanger so something with approximately that thickness would be best. Hello, first of all , many thanks for the Pattern!!!. I think that Round 25 don’t seem to right …. I made four times the same Round and came out wrong… Do I made any mistake ? Again, many thanks for the Pattern. Hi, the Round I commented above, is from the Head (round 25). Would You please, help me to understand where I made any mistake crocheting the Head, because I just could make two times 12 SC and 2deacreses, and them left 6SC… Sorry for any trouble. Hi, topshell- when joined al hexogan and finish row 4 you write 120 sts? how can it be 120 when you have dec? you are starting with 120 sts, you dec and end up with 120 sts? Can you tell me her(the turtle) approximate size. I’m confused on beginning the feet. How many sets are in a he chains? Thank you so much for sharing and taking the time to translate! I hope you are feeling better and cancer free! I will keep you in my prayers!??? I made this for my 13 yo granddaughter. Made her in schools. She was so tickled with her new friend. Thanks for the translated pattern. Why is there 3dc together when there is no dc made though this pattern it doesn’t come out right. The right amount of stitches.